Installation and setup is quick, easy and largely wizard driven. A separate Campaign Monitor account is required, if you don't have one click here to sign up. We support both the Salesforce Classic and Lighting user interfaces and the not for profit success pack. You can install into your Salesforce production, sandbox or developer orgs. Once installed you get a free 14 day trial of our premium features unless you are in a sandbox of developer account which provides a longer trial. In a Salesforce production org after 14 days you will be automatically placed on a free limited plan, unless you have already purchased within the application. If you are new to Campaign Monitor please ensure you are set up correctly and have verified your account before you start the installation. If you have questions about Campaign Monitor, please reach out to them directly. Go to our Salesforce AppExchange listing. If you are not already logged in you will be prompted to do so. Choose whether to Install in production or a sandbox. Select I have read and agree to the terms and conditions, then click Confirm and Install. Choose whether to install for Admins Only, All Users or Specific Profiles. We recommend you select Admins Only and once installed give users access via our permission sets. Select Yes, grant access to these third-party websites then click Continue. It usually takes Salesforce less than 10 minutes to install, once complete you will receive a confirmation email. 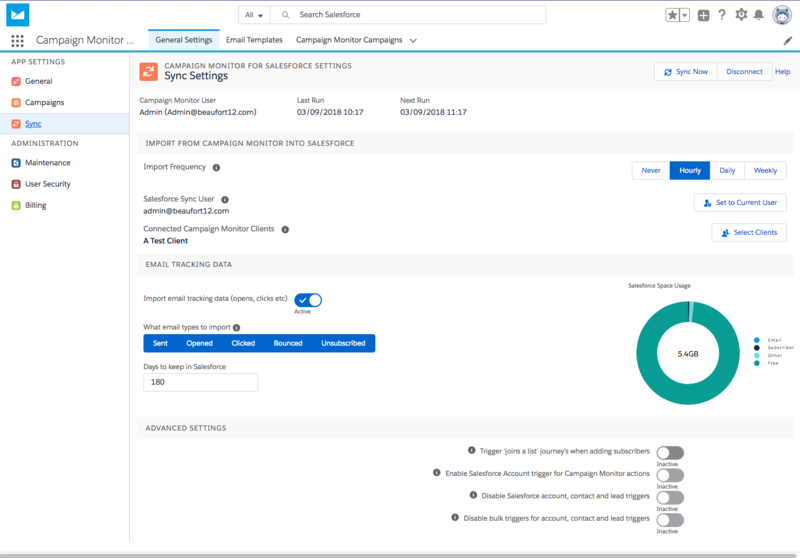 In Salesforce, click the app menu/launcher select Campaign Monitor Admin. Click the General Settings tab to start the connection wizard. Click Connect to Campaign Monitor, enter your Campaign Monitor login details and follow the on-screen prompts to access your account. Click Allow access when done. If you are using Campaign Monitor sub-clients you will be asked which client you want to connect. When the connection is made you will see on screen confirmation. The setup wizard will now automatically setup page layouts and enable the sync. The primary sync (this pulls information from Campaign Monitor) will run every hour. Email tracking statistics will be limited to the last 180 days. Both of these settings can be changed via our General Settings Tab in Sync Settings. After installing Campaign Monitor for Salesforce, the following custom objects will be created. These objects contain either records or settings required for our application. Our product has been designed to be self contained in order to not impact standard objects. Our object structure should not be customised as it may stop our application working correctly or stop automated upgrades.